USER SCORE:92%The percentage of users who liked this based on high quality reviews from sources such as Google Play, iTunes, and Amazon Music. Above 75% is green. ? 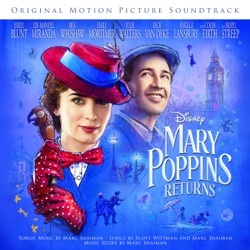 The Mary Poppins Returns Soundtrack is the soundtrack to the 2018 Mary Poppins Returns film, released by Walt Disney Records on December 7, 2018. The songs are fresh and frothy and lend themselves to dance, which is their main purpose in a musical really. Will kids 50+ years from now be humming them? Well, probably not, but they’re suitably sweet nevertheless. The songs are OK but not classics. They just lack the flow or earworm stickability of traditional Disney tunes. I would have cut at least two big musical numbers. The new songs composed by Marc Shaiman and Scott Wittman are far from being as powerful and memorable as the themes of the original film of Richard M. Sherman and Robert B. Sherman. Time will tell if these songs have the staying power of a Supercalifragilisticexpialadocious or Feed the Birds, though it’s a hummable, luscious score, which is confident to quote from the original. The musical stylings of the award-winning composer Marc Shaiman (TV’s “Smash,” “Hairspray”) fall on deaf ears in my case. None of the movie’s songs are as infectious as the original Sherman brothers-penned ditties. It’s hard not to get swept away on a tidal wave of nostalgia when the familiar instrumental themes from the first film play. The songs, by Marc Shaiman and Scott Whitman, are similarly cut from the same melodic cloth as the first movie, although not quite as memorable. The songs are tuneful but not especially memorable. A catalog of catchy original songs. It’s fine; there might well be Oscar nominations for a song or two. The songs are not bad ... though I can’t for the life of me recall a single one of them. The music, by veteran Marc Shaiman, sounds like a direct-to-video attempt to imitate the original tunes without getting too close. Though the songs, written by Marc Shaiman and Scott Wittman, who previously collaborated on the Broadway iterations of Hairspray and Charlie and the Chocolate Factory, are lovely, they don’t stick. Loaded with songs that, while new, fill the spaces of the Sherman brothers’ classics. The music falls a little flat on the whole. Cliché Broadway compositions that lack the memorable delight of Richard and Robert Sherman’s songs for the original Mary Poppins in 1964. The songs, by Marc Shaiman and Scott Wittman, may not have the magic of Sherman Brothers classics such as Feed The Birds, Supercali… but they’re clever and catchy and may improve with repeat viewing. As for the dozen-plus new songs on the soundtrack, they are instantly singalong-friendly, and (just like The Greatest Showman) will be the key to people wanting to experience the movie a second and third time (at the very least!). The music is where the film falters, however, with none of the songs ever reaching the sweepingly-catchy heights of their predecessors. The songs in this follow-up are not as memorable. The new songs may not brand themselves as indelibly as the old. But they are lyrically smart and melodically echo the 1964 glories with the same relish as the late song-and-dance run-out for Van Dyke. Channelling that old Sherman magic. Some of the songs are more impressive than enjoyable (and some aren’t even that). Features plenty of toe-tapping numbers – though not quite as catchy – to have you singing all the way to the parking lot. While they might not be as memorable or stand the test of time as have some of the original film's songs -- such as "A Spoonful of Sugar," "Chim Chim Cher-ee," "Let's Go Fly a Kite," and, of course, the hard to spell but easy to sing "Supercalifragilisticexpialidocious" -- the offerings here are good. Every song in Mary Poppins was a winner, beloved and memorable. Not so much Mary Poppins Returns. The songs are all catchy, the message is hopeful and optimistic. I didn’t come out humming any of the songs ... Still, I suppose momentary joy is better than no joy at all. The songs, by Hairspray duo Mark Shaiman and Scott Wittman, are catchy and buoyant. Whilst there is nothing quite as immediate as, say, ‘A Spoonful of Sugar’ Scott Wittman and Marc Shaiman have come up with a plethora of tunes that, in the same way as The Greatest Showman captured our ears, feel instantly familiar. Nearly every song (by Hairspray’s composers) updates one in the original. Though most are merely catchy, not immortal earworms. None of these new songs stirs the emotions with the simple, rewarding directness of hits from other recent family-oriented movies, such as “Remember Me” from Coco or “Tightrope” from The Greatest Showman. The music falls short—it’s fragilicious. Composer Marc Shaiman and his co-lyricist Scott Wittman do their best to carry the baton and come up with some real toe-tappers that seem perfectly at home in the Poppins world. The songs, by Marc Shaiman and Scott Wittman, are one of the movie’s weak points: In general, they have a flocked-wallpaper quality, at once aggressive and anonymous. All the tunes by Marc Shaiman and Scott Wittman (whose credits include the music for “Hairspray”) are serviceable, I suppose, but none catch the ear and stay with you as you leave the theater. Not one. In fact, you’ll find yourself wishing director Rob Marshall and company had simply remade the original. There’s still an undeniable magic in its voice and its step likely to enchant adults – and hopefully kids – alike. Marc Shaiman and Scott Wittman's songs are pleasant, but fail to match the indelibility of the Sherman brothers' originals. It's from Marc Shaiman and Scott Wittman, who also collaborated on Hairspray, and it's catchy and memorable. For longtime fans and newcomers alike, the soundtrack of Mary Poppins Returns is indeed practically perfect in every way. A new score by Marc Shaiman and Scott Wittman that sounds like warmed-over Sherman brothers. This time the songs by the Broadway songwriting team Marc Shaiman and Scott Wittman are more sophisticated. The songs are mostly good, with a few top-notch musical numbers that speak to a larger point about what makes Mary Poppins Returns work. None of the songs take off on their own. The musical set pieces are terrifically well done, even if Marc Shaiman and Scott Wittman's songs don't feel as memorable as the hits-stuffed 1964 version, although time will tell. Parachuting a line or two from “Chim Chim Cher-ee” or “Let’s Go Fly a Kite” into the mix serves only to highlight the new material’s shortcomings. Mostly the melodies are good. The songbook is arguably better than that of the original film. It’s not that the songs are bad. It’s just that – unlike the Sherman brothers’ little masterpieces – they are astonishingly adequate in every regard. An appealing effort, even if it lacks the ineffable magic of the numbers that longtime Disney songsmiths Robert and Richard Sherman sprinkled throughout the original. David Magee’s new script follows most of the same beats the first film did, and each of the songs by Marc Shaiman and Scott Wittman has been patterned after a number from the 1964 movie. Anyone with even a passing familiarity with the original will recognize each beat as it approaches. That’s especially true of Marc Shaiman’s (undeniably infectious) songs. The songs, while not anywhere near as memorable as the old ones, are enjoyable enough. The sequel’s score quotes from the familiar tunes of yore, which explains why I was whistling “Chim Chim Cher-ee” all the way home from the theatre. The songs by Marc Shaiman and Scott Wittman — who have done memorable work elsewhere — are the gravest disappointment. The songs are chirpy rather than catchy. An often-rollicking and entirely enjoyable romp, recycled or not. A few of Shaiman and Wittman's compositions are memorable, from the animated kickline extravaganza "A Cover Is Not a Book" to the fantastical "Turning Turtle." The songs, the special effects, the imagination are a lot of fun. [A] slate of terrific all-new songs by Marc Shaiman and Scott Wittman. As I walked out of Mary Poppins Returns, I didn’t have any song stuck in my head nor did I remember the majority of the songs sung throughout the film. Composer and lyricist Marc Shaiman has had plenty of success in the past (Hairspray, sure, but South Park: Bigger, Longer & Uncut stands as one of the great modern movie musicals), but his soundtrack for Mary Poppins Returns can be charitably described as forgettable. Unfortunately, the Sherman Brothers’ shoes are too big to fill. The songs, written by Marc Shaiman, are a delight, even if there isn’t anything quite as memorable as the Oscar-winning Chim Chim Cher-ee from the original. The music is pleasant but bland. It seems unlikely that in 2070, middle-aged people will still be able to hum any of these tunes – although no doubt they, too will fondly remember a certain flying nanny. The songs don’t quite hold a candle to the glorious original tunes we all know and love, they are jaunty, catchy and clever, with the ‘Nowhere To Go But Up’ bringing buoyancy to the joyous finale. There are no musical numbers likely to endure in the public affection for decades, as so many have since 1964. Catchy original songs by Marc Shaiman and Scott Wittman. Each song provides some kind of lesson for the children. Noe of the musical numers will catch on in the pop culture lexicon the way the original did, but in their own right, spark occasional glimmers of magic. The songs by Marc Shaiman and Scott Wittman will have you dancing in your seats. Everything from the amazing production design to the colorful costumes to the catchy, upbeat songs penned by Marc Shaiman and Scott Wittman (a few of which contain references to the Sherman Bros.' original 1964 score) has that Disney glow. At first listen, it’s hard to tell if the songs are classics in the making. They sounded rather derivative, with nothing to match, for instance, the one about the word that, if you say it loud enough, you’ll always sounds precocious. The Meryl Streep number is a weak link and the verbose score (‘When troubles seem incessant/just get a little incandescent’) can’t rival Chim Chim Cher-ee for catchiness. But the original wasn’t perfect either. Ultimately, it makes the world seem just a little bit more magical. Only one – the manic 'A Cover Is Not The Book' – doesn't quite work and could have been cut, but we'll forgive them for this blip as the others are all terrific. You won’t be humming many of these tunes, if you can remember them. None of the songs really pop off the screen, even if they’re sung well and relatively pleasant (the work of Marc Shaiman). The songs are catchy and snappy, but will they still be treasured in 60-odd years, a la “A Spoonful of Sugar”? Eh . . . . doubtful. There’s a bit of indistinguishable same-ness to them. A disappointment, where even standout songs like A Cover Is Not The Book and The Place Where Lost Things Go don’t deliver anything catchy or quotable. Apart from a wistful little number about “where the lost things go,” the score (by Marc Shaiman and Scott Wittman) leaves no residue. The songs by Marc Shaiman and Scott Wittman are sprightly, sweet and carefully crafted. And perhaps, once we’ve heard them a hundred times, they will eventually sound like classics. But on first listen, I wasn’t convinced that any of them beat A Spoonful of Sugar, Let’s Go Fly a Kite or Supercalifragilisticexpialidocious. The songs have an awful lot of child-friendly lessons to impart — appearances can be deceiving! Embrace the nuttiness of life! The dead never truly leave us! — and largely come off as muddled harangues. By playing so closely to outline of the original—even using familiar melodies in its instrumentals—it’s impossible not to compare the two, and by comparison, the sequel suffers. I had lost count of how many times the singing and dancing had blown my mind. The problem is that none of [the songs] (them) are especially memorable, though Returns seems determined to drill them into your head by making them both repetitive and interminable. It all blurs together into one ill-defined mass, nothing distinct enough (besides, I suppose, that opening number) to stick out. The music and choreography is impressive. The songs themselves, written by the Hairspray duo Marc Shaiman and Scott Wittman, are all unqualified knock-outs, with all the infectious breeziness and soaring orchestration of the Sherman brothers originals. The songs are square (though frankly, while good enough, not nearly as timeless as the Sherman brothers’ classics from the earlier film). While none of the songs make as strong a first impression as “Supercalifragilisticexpialidocious” or “Chim-Chim-Cheree,” there are some lovely tunes. While the music in Mary Poppins Returns is beguiling, it is also primarily forgettable. Den of Geek News! Den of Geek News! There’s not a song in Mary Poppins Returns that has the staying power of “A Spoonful of Sugar” or “Supercalifragilisticexpialidocious”. If you are expecting to hear a remixed or new rendition of classics like “Supercalifragilisticexpialidocious”, “A Spoonful of Sugar” or “Chim Chim Cher-ee” you may set yourself up for disappointment. Mary Poppins Returns features all new original songs just for this sequel. Marc Shaiman’s score is a swinging delight (with melodic hints here and there of older “Poppins” tunes), and his original songs, while perhaps not as earwormy as “A Spoonful of Sugar,” are a strong bunch. All new original songs, which are as beautiful and catchy as the ones from the first movie. While composer Marc Shaiman (who co-wrote the lyrics with Scott Wittman) does a note-perfect job of recapturing the general Poppins vibe, there isn’t a memorable tune in the bunch; for better or worse, you won’t be haunted by these songs. The songs aren’t instantly memorable. Tuneful songs from Marc Shaiman and Scott Wittman that genuflect to the invaluable contributions of the Sherman Brothers on Mary Poppins. There is no “Spoonful of Sugar” or “Supercalifragilisticexpialidocious!” or “Chim Chim Cheree” among the nine new songs, though composer Marc Shaiman and lyricist Scott Whittman (Broadway’s “Hairspray”) come up with a couple of minor jewels of their own. Dutifully replicating the narrative and tonal beats of the original almost note for note, only with less memorable songs and a less present Mary Poppins. You’ll likely be humming the melodies of more than a few of the tunes from “Returns” as you exit the theater, and in the days and weeks to follow. Conversely, you can watch all of “Mary Poppins Returns” and walk out of the theater unable to hum a single tune. This would be supercalifragilisticexpialidocious to add to any Disney fan’s collection. The songs of Mary Poppins Returns are almost shockingly forgettable. Saccharine explodes all over everything like sonic popping candy. I don’t care who you are, you need a little Mary Poppins in your life and the soundtrack to Mary Poppins Returns repeatedly delivers. Marc Shaiman was born for this! Gorgeous!! Marc Shaiman has been one of my greatest musical heroes for many years, and getting to hear him REALLY score & compose in this style is as wonderful as the film... five stars! A spoonful of sugar helps the Soundtrack go down Hey Emily Blunt has a Mary Poppins way about her and she is more a convincing singer than Lindsay Lohan 😂! Practically Perfect! I absolutely love this soundtrack. Obviously, I love everything related to Mary Poppins, but this is just as amazing as any other recording.